This afternoon , I happened to look out my kitchen window and noticed a lone Common Redpoll, hopping around our Crab-apple Tree. It would then jump onto the ground and eat some seed that had fallen out of the feeder. I must have looked away for a few minutes, because when I looked back again, the Redpoll had gone , and in its place was this handsome adult Sharp-shinned Hawk. Great shots, the other day I was outside when I heard a big bird flapping through the evergreens out back. 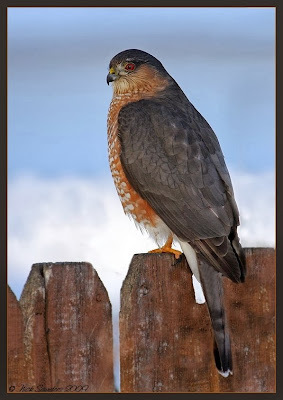 When I looked I saw a flash of brown so I think I have a hawk of some type hanging around feeding on the birds visiting the feeder. 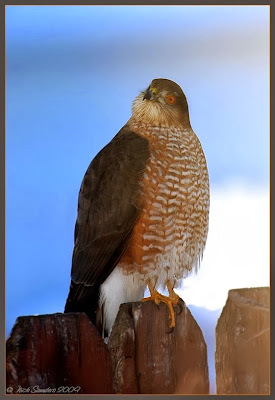 Every once in a while I notice all the songbirds frozen in place so the hawk must still make visits. I'm gonna keep a look out, maybe I'll be able to get a shot of it. Thanks John. With these accipiters, you really have to be there at the right time. I've missed countless shots, by only noticing them at the last minute. If you have time, just keep a vigil at your window for a few hours so you don't miss anything. I think the Hawk is showing us his best features - great photos! Beautiful bird. I can understand why the other birds were a bit nervous. Excellent photo, love the sky in these! Great shots. You do an excellent job with the birds. Are you using the 100-400mm Canon L lens? It appears to be that lens without a lens hood in your profile photo. I ask because I use one of them quite a bit. I use a 500mmF4 when I can, but I find it is not nearly as versatile and still use the zoom when I need to shoot in a hurry, etc. Thanks everyone. Yes, Willard. 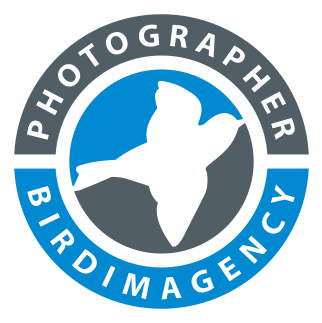 I use the 100-400 L. I have never used it with the lens hood as its too much hassle to keep taking it off when I want to put the camera back in its bag while walking about. Thanks for the info on the lens. I usually do use mine with the hood, but I think it is a real pain to take off and I have cracked it slightly in doing so. I really don't think the hood is necessary in most cases either. We went to Shenandoah National Park today and most of the shooting was from the vehicle. I used the 100-400 or the 17-40 most of the time. I never got the 500mm in action, but there are plenty of times that I don't want to be without it, especially with the local whitetail deer herd. Thanks Willard, sounds like you keep yourself pretty busy ! Wonderful! It must be great to look out your window and see something like this. Cool!